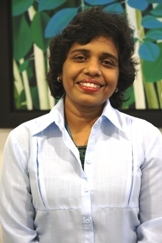 Dr Jeyanthi Selvarajah joined Monash University Sunway Campus in June 2008. She is a member of the Chartered Association Accountants. She has worked at corporate sectors both in the United Kingdom and Malaysia and has vast teaching experiences at tertiary institutions. Prior to joining Monash University Sunway Campus as a full-time lecturer, she has taught at the Multimedia University of Malaysia and at Metropolitan College. Dr Jeyanthi is experienced in teaching both accounting and finance areas. Subjects taught are Financial Accounting, Management Accounting, Financial Reporting Standards, Portfolio Management, Principles of Corporate Finance, Financial Theory and Corporate Policy. Strategic Management and International Banking and Finance. Currently she is teaching AFW 3050 Financial Accounting Issues and AFW 1002 Accounting B at the School of Business. Since joining Monash University Sunway Campus, Jeyanthi has co-authored two articles on FRS 139 and Windfall tax for publications in The Company Lawyer and Tax Notes International respectively. Prior papers presented were on The Study of the Malaysian Palm Oil Market Demand and The Determinants of the Price-Earning Ratio for KLSE Listed Companies. Her research interests are in both accounting and finance areas. She is currently pursuing her doctorate degree in behavioral finance. Kassipillai, J. and Selvajarah, J. (2009), "Tax Guidelines for Financial Institutions Adopting FRS 139 and its impact on commercial activities", The Company Lawyer.